How to Purchase the Best Air Conditioner Brand in India? India is developing that increases the purchasing power of middle-class people which allow them to afford a luxury lifestyle for themselves. The time has gone when buying an air conditioner was the mark of luxury. Now it can easily find in middle-class families, not only in metros but also in small towns or villages. With the invention of the latest technology, energy-saving circuits, and healthcare benefits people become more aware of the requirement and benefits of such appliances. It is always challenging to choose from the range of best air conditioner brand in india. With the growing demand for air conditioners, industry experts concentrate on developing new technologies that make air conditioner an energy efficient, health benefitting and a five-star rating machine. These air conditions are manufacturing especially for Indian consumers that work efficiently according to the Indian climate. 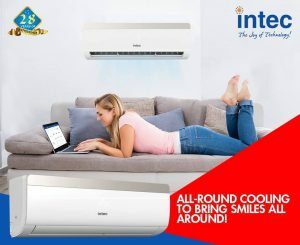 Besides providing efficient cooling the new age air conditions are loaded with extra features such as humidity control, air purification, and also added with new features like repelling mosquitoes non-toxically to let you enjoy a sound sleep, particularly in seasons when epidemics like dengue, malaria, etc. spread frequently. You need to consider a few factors before buying an air conditioner according to your requirement. Energy Efficient: The increasing electricity tariff has risen the demand for energy saving air conditioners. The Bureau of Energy Efficiency has provided star ratings to air conditioners which range from 2 stars to 5 stars. The more the star rating an air conditioner has, the more it is energy efficient. Intec manufactures the lowest power consumption air conditioner in india. Split or Windows AC: Another factor to consider is whether to buy split or windows air conditioner. Window-based air conditioners are quite cheaper in rates in comparison to split ACs. On the other hand split, ACs provide better air distribution and looks attractive in the room. Product Price: It is among one of the important factors to decide which air conditioner you should by. The AC with more features and a higher star rating will cost high. The air conditioner manufacturer in india increases the cost by Rs.2000 to Rs.3000 for every star rating increases. An inverter AC cost you 20% more in comparison to five stars split AC. Installation: A windows air conditioner is compact in design, hence can be installed on windows. Whereas split AC comes with two units that occupy extra space for installation. The compressor unit is installed in the balcony or at the roof while the indoor unit is installed in your room to provide air flow. Always prefer that air conditioner should be installed by the professional or authorized service engineer. Though, lots of other factors are also responsible for locking your decision such as cooling speed, after sales services, etc. You better know what do you want and where to buy intec air conditioner. Previous Article Which Intec Air Conditioner should I buy? A detailed comparison between Windows AC and Split AC.